Meeting a young child’s nutrient requirements can be a challenge. Many children do not meet the recommended daily requirements for vitamin D, vitamin E, calcium, iron, and zinc, putting them at risk for nutritional deficiencies, thus compromising their growth and development. Just 3 servings per day of S-26 Progress GOLD® provide a large percentage of the key nutrients for toddlers. S-26 Progress GOLD® is fortified with an appropriate level of iron to reduce the risk of anemia, and is enriched with preformed arachionic acid (AA) and docosahexaenoic acid (DHA), which play an important role in brain and vision development. S-26 Progress GOLD® ensure adequate intake of at-risk nutrients, including iron, vitamin D, and zinc. S-26 Progress GOLD® is also fortified with nucleotides, which play a role in the growth and proper functioning of the intestines. Lactose, Skimmed Milk Powder, Vegetable Oils [Soybean Oil, High Oleic Sunflower Oil, Palm Oil, Docosahexaenoic Acid (DHA) of Crypthecodinium cohnii origin, Arachidonic Acid (AA) of Mortierella alpina origin], Whey Protein (from Cow’s Milk), Maltodextrin, Oligofructose, Emulsifiers (Lecithin Soy, Monoglycerides Distilled INS471), 2'-Fucosyl-D-Lactose, Taurine, Artificial Flavor (Ethyl Vanillin), Acidity Regulator (Citric Acid), Nucleotides (Cytidine 5'-Monophosphate, Disodium Uridine-5'-Monophosphate, Adenosine-5'-Monophosphate, Disodium Inosine-5'- Monophosphate, Disodium Guanosine-5'-Monophosphate), Antioxidants (Mixed Tocopherols Concentrate, L-Ascorbyl Palmitate), Lutein (from Marigold). Vitamins: Choline Chloride, Vitamin C, Inositol, Niacin, Vitamin E, Pantothenic Acid, Vitamin A, Carotenes, Vitamin B1, Vitamin B2, Vitamin D, Vitamin B6, Folic Acid, Vitamin K, Biotin, Vitamin B12. Minerals: Potassium Citrate, Calcium Carbonate, Potassium Hydroxide, Sodium Phosphate, Calcium Phosphate, Potassium Carbonate, Sodium Citrate, Ferrous Sulfate, Magnesium Chloride, Zinc Sulfate, Manganese Sulfate, Copper Sulfate, Potassium Iodide, Sodium Selenite. Contains Milk, Soy & Corn. Wash your hands before preparing formula. Wash cup thoroughly until no milk remains. Consult feeding table, pour exact amount of lukewarm water into the cup. Consult feeding table, add exact number of level scoops into cup. Stir until powder completely dissolves. Pantothenic Acid, Vitamin A, Carotenes, Vitamin B1, Vitamin B2, Vitamin D, Vitamin B6, Folic Acid, Vitamin K, Biotin, Vitamin B12. Minerals: Potassium Citrate, Calcium Carbonate, Potassium Hydroxide, Sodium Phosphate, Calcium Phosphate, Potassium Carbonate, Sodium Citrate, Ferrous Sulfate, Magnesium Chloride, Zinc Sulfate, Manganese Sulfate, Copper Sulfate, Potassium Iodide, Sodium Selenite. Contains Milk, Soy & Corn. Wyeth Nutrition’s premium growing up milk for preschoolers from 1-3 years of age to support the synergy of mental, physical and emotional learning in early life. S-26 Progress GOLD® features the advanced Wyeth Biofactors System™, a scientifically advanced blend of the highest quality nutrients working together and provides you with expert developed services, tools and tips to help you enhance your child’s mental, physical and emotional development. Wyeth Nutrition’s over 100 years of heritage is dedicated to helping the next generation of children develop to their full potential and live healthier lives by providing high-quality, innovative and scientifically proven nutrition for children in the first crucial years of life. Skimmed Cow’s Milk Powder, Maltodextrin, Lactose, Whey Protein, Soybean Oil, Sunflower Oil, Palm Oil, Fructo-Oligosaccharide, Acidity Regulator (Citric Acid), Emulsifier (Soy Lecithin, Monoglycerides E471 of plant origin), Taurine, Arachidonic Acid (AA) of Mortierella alpina origin, Flavor (Ethyl Vanillin), Docosahexaenoic Acid (DHA) of Crypthecodinium cohnii origin, Nucleotides, Antioxidants (Mixed Tocopherols Concentrate, Ascorbyl Palmitate), Safflower Oil, Lutein (from Marigold), Vitamins & Minerals. Contains Milk, Soy and Corn. Our brands feature the advanced NUTRILEARN SYSTEM™, a scientifically advanced blend of the highest quality nutrients working together to help you enhance your child’s mental and physical development. The World Health Organization recommends exclusive breastfeeding during the first 6 months of life and continued breastfeeding for as long as possible. 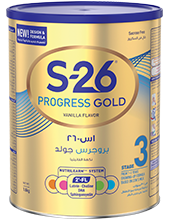 S-26 Progress GOLD and S-26 Prokids GOLD are not a breast milk substitute but growing up milks specially suited to healthy young children aged 1-3 years and 3-6 years respectively.